Transforms your ideas into models, perfect and controlled. Reversible folds and darts, seam allowance, size change, dimension and notch identification are the functions that enable quick and perfect pattern design. Your native Gerber, Lectra o Assyst files will be automatically converted and ready to be used. Import and export in/from international standard formats. 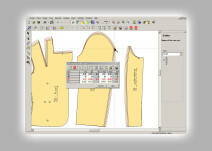 When you design your own products or your collections, Kuris Pattern Designer is the software environment in which the designer’s ideas are easily transformed into perfectly built and checked pattern projects. Gifted with unique design functions like reversible folds and darts, automatic and interactive seam allowance creation, automatic notch translation and the all-sizes dimension sensor, Kuris allows a quick and perfect pattern design. 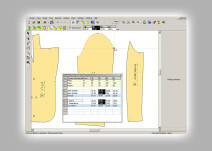 Automatic and interactive grading functions allow the previous design data to be stored and easily applied to new products. 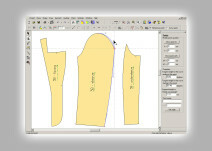 Kuris Pattern Designer is based on Bezier curves, but can also handle complex polylines or B-Spline Curves. The KPD’s interface has a very different approach compared to other CAD applications, because is built to be extremely user friendly, according to the latest software standards. KPD comes as standards with a built-in convertor for Gerber, Assyst and Lectra native files and also for DXF-AAMA import and export.